Much like the Red Sox getting swept by a less talented team, this article is not going to be a proper send off for David Ortiz. 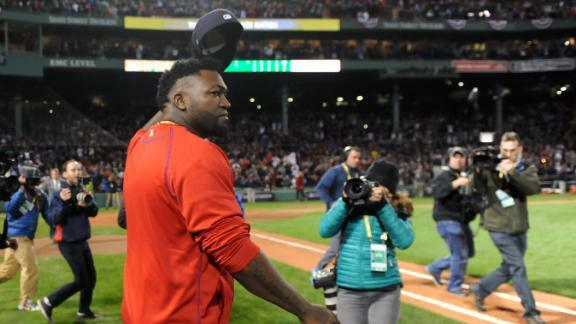 I have a nice, long farewell article for Papi in the works, and I’ll release it once I get over the disappointment of losing a series that we were fully expected to win. Personally, I’m not ready to get sad yet. When Ortiz took the field to say one last goodbye to the fans on Monday night, I turned the TV off. I was too pissed about losing. It wasn’t supposed to end this way, and I wasn’t ready to put my anger aside just yet. So I waited until the next day to watch the clip of him tipping his cap to the Fenway faithful while fighting back tears, and of course it was impossible not to get choked up. You know his sadness is a combination of things. The realization that he’ll never play in front of those fans again combined with the fact that he wasn’t ready for it to be over. Nobody was. Less than a week ago we were all getting pumped up for Ortiz’s last postseason run. Now he’s already done. So excuse me if I’m in a state of shock and it’s hard for me to be sentimental right now. But I’ll try. I know you didn’t want to go out like this. And being the competitor you are, I know it’ll take some time to get over this loss before you can sit back and reflect on your Hall of Fame career. No one who’s reached the levels of greatness that you have is okay with being swept in a first round playoff series. As a fan who’s watched you for the last 13 years, I’m not okay with it either. You deserved better, but for whatever reason it just didn’t work out. Enjoy retirement and enjoy the love that Boston will continue to shower you with for the rest of your life, because I know you didn’t enjoy that last series. Neither did we, but you’re still our hero and that will never change.